On the Economic development through the 20. century, how Reagan with 'think tanks' etc. worked to 'destabilize' the Soviet Union, influenced the economic thinking in the West and how US finally succeede in the breakup of USSR. The movement toward the neoliberal utopia of a pure and perfect market is made possible by the politics of financial deregulation. (..) .. the nation, whose space to manoeuvre continually decreases. In this way, a Darwinian world emerges - it is the struggle of all against all at all levels of the hierarchy, which finds support through everyone clinging to their job and organisation under conditions of insecurity, suffering, and stress." "The state nobility, which preaches the withering away of the state and the undivided reign of the market and the consumer, the commercial substitute for the citizen, has kidnapped the state: it has made the public good a private good, has made the 'public thing', res publica, the Republic, its own thing. (..) The national states are undermined from outside by these financial forces, and they are undermined from inside by those who act as the accomplices of these financial forces, in other words, the financiers, bankers and finance ministry officials. I think that the dominated groups in society have an interest in defending the state, particularly in its social aspect." "One might say that in the headquarters of the corporations, whose collective interest is clearly reflected in American government policies, nostalgia has lingered on for the good old days of Hitler’s Third Reich, which was a paradise for German as well as American and other foreign firms: no left-wing parties, no unions, unlimited numbers of slave labourers, and an authoritarian state that provided the necessary discipline and arranged for an “armament boom” and eventually a war that brought “horizonless profits..."
Nobel Prize economists have shaped the economic profession. But it is The Swedish Central Bank that has the power to control the selection of economists, who shall receive the prize. The Swedish Central Bank thereby control, what should be rewarded: what shall and shall not count as important, true and correct knowledge in the economic profession. So, The Swedish Central Bank has more or less controlled the development of the Western economic profession and the development of economic faculties all over the Western world. The role of MIT is important here too. This way a uniform neoliberal economic profession has emerged to 'inform' the Western world. Moreover, the profession is given even more power in a historical neoliberal hegemonical context dedicated to the rule of (neoliberal) economics. The profession's economic advice is praised by neoliberal governments and the 'knowledge' is blessed with the prestige of a particularly powerful social, political and scientific legitimacy from the continuation of Nobel Prize awards. It is almost a waterproof system dedicated to god-like untouchable experts. No wonder, that practically no economist from withing the profession ever feels an urge to question not to talk about problematizing the social power and legitimacy of their scientific credentials, which their scientific prestige and power monopoly rests on. They simply cannot fail, mind you, as long as they stick to the neoliberal and neo-classical dogmas. This way, and this way only, they enjoy the full benefits of the power and the glory. Add also, that they are systematically trained not to be able to understand the connections between their 'science' and the real world. As for social reality, it seems that Harold Pinter's diagnosis of Western muteness fits in here too: "You wouldn't know it. It never happened. Nothing ever happened. Even while it was happening it wasn't happening. It didn't matter. It was of no interest." For the economists, the important thing is the concept of less 'hindrances' toward a free market utopia and, of course, their mathematical models. It is tragic-comical. Pierre Bourdieu explains the economic profession: "Without necessarily sharing the economic and social interests of the true believers, economists have sufficient specific interests in the field of economic science to make a decisive contribution, whatever their emotional responses to the economic and social effects of the utopia that they dress up in mathematical reason, to the production and reproduction of the neo-liberal utopia. Cut off by their whole existence and above all by their generally purely abstract and theoretical intellectual training from the real economic and social world, they are, like others in other times in the field of philosophy, particularly inclined to take the things of logic for the logic of things. Trusting in models that they have practically never had the occasion to subject to experimental verification, tending to look down from on high on the conclusions of the other historical sciences, in which they recognize only the purity and crystalline transparency of their mathematical games and whose real necessity and deep complexity they are most often unable to comprehend, they participate and collaborate in an enormous economic and social transformation which, even if some of its consequences horrify them (they may subscribe to the Socialist Party and give considered advice to its representatives in the highest decision-making bodies), cannot entirely displease them, since, with a few 'blips', mainly attributable to what they call 'speculative fevers', it tends to give reality to the ultra-consistent utopia (like some forms of lunacy) to which they devote their lives." Still, the economic profession function as a uniform non-controversial scientific collective, as if there were no basic assumptions to problematize or discuss. This 'science' has gotten a most simple but powerful mission (no doubt, most of the economist have no idea that they have been duped), that is, to systematically whitewash and praise all kinds of neoliberal policies with scientific legitimacy. The Western economic profession is completely disconnected from reality and infested with neoliberal ideology and mathematical abstractions. It is a profession based on totally false and destructive ideas and assumptions, which coincidently back all the neoliberal policies originating from the corporate system's ideological drafts for a neoliberal utopia. What are the consequences in the real world? Just look at our societies' development since 1975. The Western world has been experiencing the same economic thinking, the 'chok-doctrine that used to be used only on 'third-world' nations and for Russia's 'katastroika', where it continues a systematic destruction of the historical civilizational gains that were won through labor and political struggles up through the twentieth century. It is totally false and totally destructive. Thatcher's and Reagans' infamous TINA dictum: There Is No Alternative is a false iron cage created by big business and upheld by scientific fraud. The most amazing thing is perhaps that most economists have never realized that they have been duped into acting useful idiots to help implement the neoliberal utopia. They have never received any training that gives them the intellectual tools necessary to question their neo-classical economic training. So, they are in fact helpless but powerful fools. Michael Hudson (among many things) tells the story of Steve Keens career. Keen is an Australian economist, who was among the economists that predicted the finance crisis in 2008. Keen has arguably written the most systematic critique of the economic profession's lack of empirical evidence, logical argument and false epistemology (basic assumptions): Debunking Economics - the Naked Emperor Dethroned? In his important book, Keen addresses economic students and their parents to warn them against the profession. Keen's university in Australia could not fire him, tells Hudson, so they simply closed down the whole economic faculty. They had to pay Keen for lost payment, but he was out. Hudson then explains that the Washington list of 'fake news' sites entailed all the sites that publishes Hudson's articles. Michael Hudson explains Junk Economics, 2017 It sure looks like a common strategy to keep true economics out. So many of the essential insights that Modern Monetary Theory (MMT) are based on were known 100 years ago and remain as true today as they were then (and every period in between). Conclusion. The rest of the book explains why this puzzle was easy to solve but came up against an ideological resistance (to government spending in peacetime that advanced well-being). Neoliberalism is an ideological willed and financed big business project. The corporate business system systematically corrupt science (not only economics), journalism and politics, where the most cynical ambitious people make careers by promoting and implementing the most cynical policies for the corporate system. The perfect politicians, as the French novelist Michel Houellebecq portrays it in Submission, are politicians that never think one thought themselves. It is an ideology created and propagated all over the political and intellectual landscape since WWII. Therefore, the destruction of workers rights and welfare rights inclusive the 'globalist trade-deals' etc. that we have witnessed since the 1970'ties are all part of a deliberate plan to create 'free-market-corporate-state-societies'. "In this way, a Darwinian world emerges - it is the struggle of all against all at all levels of the hierarchy, which finds support through everyone clinging to their job and organisation under conditions of insecurity, suffering, and stress. (...) "The movement toward the neoliberal utopia of a pure and perfect market is made possible by the politics of financial deregulation. And it is achieved through the transformative and, it must be said, destructive action of all of the political measures (of which the most recent is the Multilateral Agreement on Investment (MAI), designed to protect foreign corporations and their investments from national states) that aim to call into question any and all collective structures that could serve as an obstacle to the logic of the pure market: the nation, whose space to manoeuvre continually decreases; ..."
"Exploring the genesis of neoliberalism, and the political and economic circumstances of its deployment, Pierre Dardot and Christian Laval dispel numerous common misconceptions. Neoliberalism is neither a return to classical liberalism nor the restoration of “pure” capitalism. To misinterpret neoliberalism is to fail to understand what is new about it: far from viewing the market as a natural given that limits state action, neoliberalism seeks to construct the market and make the firm a model for governments. Only once this is grasped will its opponents be able to meet the unprecedented political and intellectual challenge it poses." 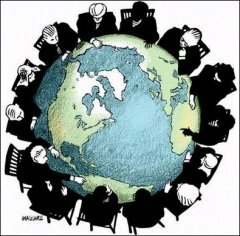 The New Way of the World: On Neoliberal Society, 2014, Laval & Dardot / "
In other words, a crucial neoliberal insight [Polanyi, JK Galbraith, Bourdieu etc. ], which complicates criticism of the market, is that economic competition is not a natural phenomenon, but a coherent idea that must be realised and sustained by the state. As such, the state must intervene, not to limit the market, but in society, so as to create the conditions that support competition. Foucault points out that a central tension in ordoliberalism lies in its judgment that market processes are fragile and need the support of welfare state interventions, if the market is to be viable. Noam Chomsky - Global Hegemony: the Facts, the Images, April 20, 2011. What is Neo-Liberalism? A Revolutionary Analysis of the Final Stage of Imperialism. by Danny Haiphong, 25. Feb. 2015. “The worst crimes were dared by a few, willed by more, and tolerated by all.